In Baltimore, Crab is King. More specifically, it is the Maryland Blue Crab that is afforded royalty status. Even its scientific name — Callinectes sapidus – gets at the key reason why, translating as it does, as “beautiful swimmer that is savory.” I have never seen a blue crab swim but there can be no doubt that it is savory. 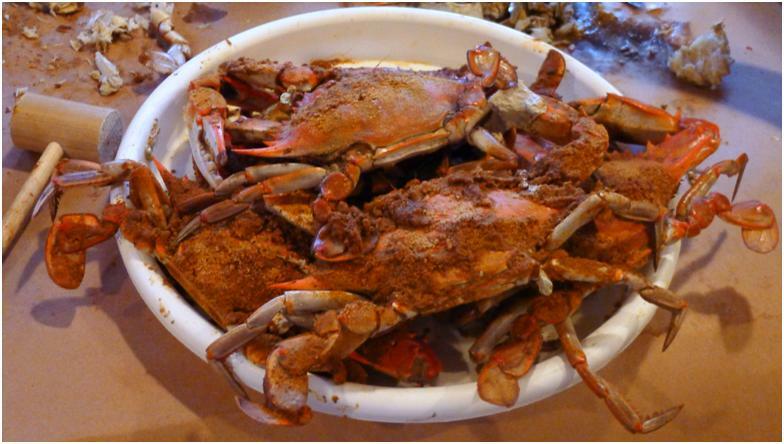 Baltimoreans eat their crab in many ways: crab bisque, crab cakes, dips and spreads, crab puffs and many more. 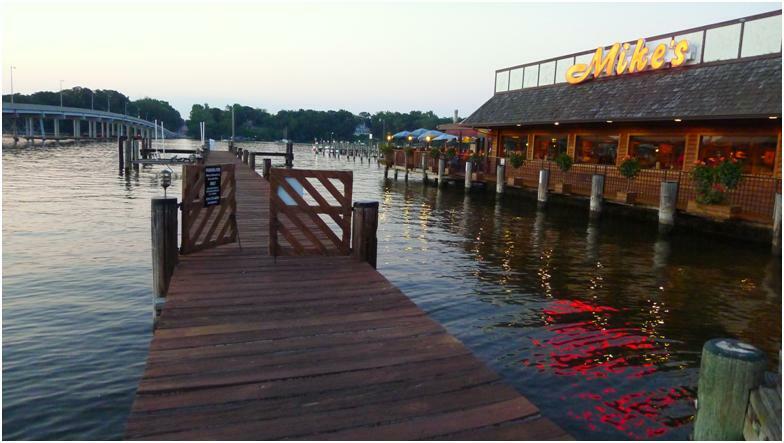 There is, though, nothing better than working your way through a table full of with crab steamed in Old Bay Seasoning at a waterside crab joint with the Chesapeake Bay in sight. First they bring out the butcher paper, next they pile it high with steamed crabs and bring out the mallet. The next half hour is a delicious ritual of pounding, picking and consuming shellfish meat that is as sweet as any you will ever eat. 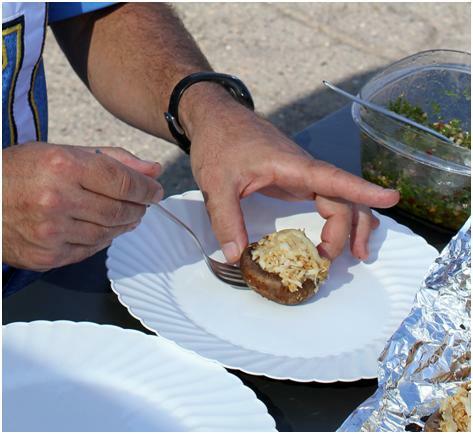 But Old Bay Steamed Blue Crab seemed a bit impractical for a Qualcomm Stadium tailgate. And with crab cakes having already made two appearances in this space — http://sdfoodtravel.com/san-diego-curried-crab-and-corn-cakes-with-roasted-red-pepper-sauce-and-parsley-oil/ and http://sdfoodtravel.com/san-diego-on-time-travel-and-a-pop-up-50th/ — we clearly wanted to go a different direction. 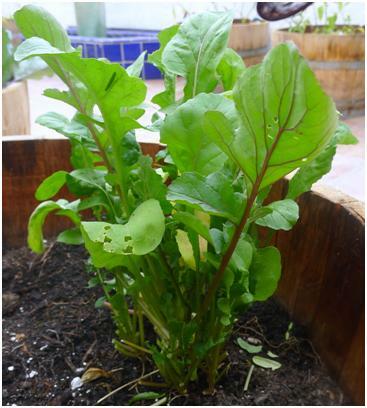 We found the inspiration for the answer growing in our front yard: arugula. From there it was a short distance to Crab Stuffed Baby Portobello Mushrooms with Arugula Chimichurri. The addition of Old Bay Seasoning (doctored to taste with a bit of additional paprika, some cayenne pepper, ground ginger and onion powder) to the stuffing echoes the flavors of those Chesapeake Bay-side crab joints. The chimichurri brought some welcome acidity to the party and the mushrooms served the dual functions of (1) delivery system and (2) umami. We prepped the ingredients at home before leaving for the Stadium, assembled it and cooked it in foil on the grill at the tailgate. One taste and I had to agree: crab IS king. Make the Arugula Chimichurri. Combine all of the ingredients in a large bowl and mix thoroughly. Make the Stuffing. In a large mixing bowl, combine the shallots, garlic, and all spices with the crab, panko bread crumbs, thyme leaves and 2/3 pound of the gruyere cheese. Mix thoroughly. Stuff the Portobello Mushrooms. Remove the stems from the Portobello mushrooms. Clean the mushrooms, either using a brush or paper towels. Place approximately a tablespoon of the stuffing in each of the mushrooms and top each with a sprinkle of the remaining cheese. Cook the Stuffed Mushrooms. 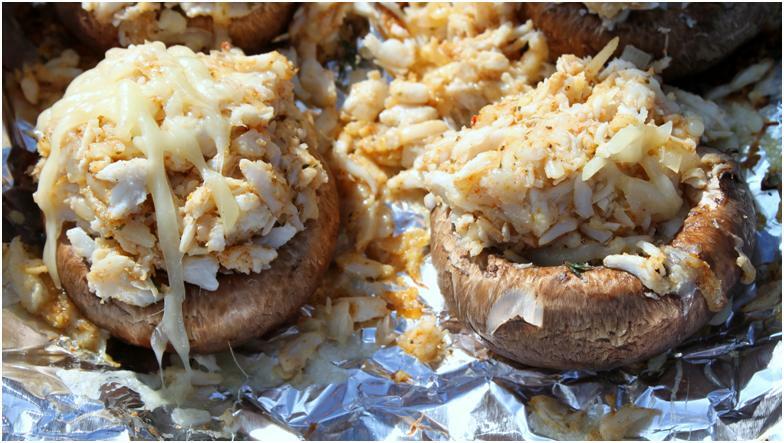 If cooking at a tailgate, place each of the stuffed mushrooms on a sheet of heavy duty aluminum foil and cover with another sheet, crimping the edges. Place the aluminum foil packet on a hot grill and cook for three or four minutes, just until the sprinkle of cheese on top of the mushrooms has melted and the mushrooms have just begun to lose a bit of their texture. The dish can also be cooked in a 375° Fahrenheit oven. Plate the Dish. Place a mushroom on each plate and drizzle with some of the chimichurri. I love the sharing of this recipe. I remember somewhere in 1986 as I read. Portobello a large dark mature cultivated mushroom noted for its meaty texture that is of the same variety of button mushroom as the cremin. Now stuffed with crab as of numerous chiefly marine broadly built decapod crustaceans. What more can you ask for another fine cuisine taste?